I couldn't wait to get started on this month's BOM from Janeen van Niekerk's Garden BOM. This month she has added a spunky little squirrel to the garden. This was another challenging one to pull fabrics for and at first I thought it might be the first block to send me to the fabric shop rather than being able to pull all the fabric from my stash...but I managed to find just what I needed. It took me a couple hours just making a fabric key so I could keep straight what fabrics went where. Here is what I came up with and it was super useful for keeping track of all the pieces making up each section. I don't think I could have kept track of everything without it. After a few hours piecing all the sections, I got enough of a view of him that I was getting excited to see him become reality. After many years of paper piecing, I have come up with a few techniques that really help put these together successfully. Recently, I started thinking that I should share how I put the many pieces together. I use to just align the pieces where I thought they should be and baste them together using large stitches and if it wasn't quite right, I would rip it out and start again. Within the last year, I have found a much better method to aligning the pieces to get an accurate placement of the sections. Paper piece patterns essentially start out as a drawing, that is then cut apart and all the sections are then given a 1/4" seam allowance all the way around. So it makes sense that when you put it all back together the intersecting points must match back up. In Janeen's instructions she wants us to put sections A and B together first. Above these are those two sections. I will flip section B on top of A.
I will then put a pin thru the two pieces at the top corner. I want the pin to pierce both sections in the corner where the two patterns meet. Hopefully, you van see what I am talking about in the next couple pictures. I want it to match up to a point similar on the bottom, if I don't get it right the first stab I will pull the pin partially out and keep trying until I get the pin in the right spot on the bottom. This is the pin coming out of the bottom corner. I need to do that at the opposite end of the section, too. When both of those pins are perpendicular, the sections will be properly aligned. When I get both pins in there holding the sections in the right alignment, I will put pins to hold the sections together when I take it back to the sewing machine to sew it together. I usually will put pins next to the perpendicular pins first, and then one in the center of the section. I add more in between if it is a larger section. Notice I keep the pins back far enough that I don't run over them when sewing the two sections together. Take note that when I sew them together, I stay right to the outside of the line. When piecing all the individual fabrics onto the sections, I sew directly on the line. But when piecing the sections together, I like to stay to the scant side of the line. I find when you iron the sections together, the added bulk of the fabric will make you lose some much needed fabric to get the correct size block in the end. At this point before moving on, I will take out the basting stitches that I put around each section when I have completed it. 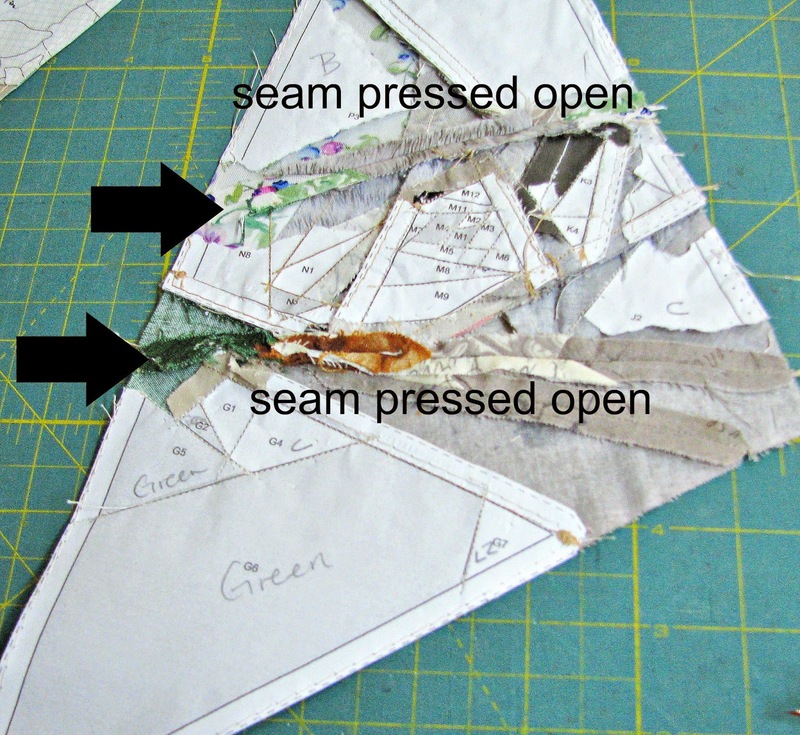 I don't know if all paper piecing tutorials suggest doing this but I find it extremely useful to baste with the stitches set at about a 4 or 5 around the entire perimeter of each section prior to me trimming it to it correct size. It does make removing the paper from the back of the section a little more time consuming but I find it to be very valuable in keeping the fabric exactly where it needs to be until I have sewn the sections together. At this point I like to remove only the basting along the line I am going to be ironing the section on. I not only take the basting out, I will pull the paper off that will be trapped under the section when I flip and iron it. It not only gives me the crispest line when ironed, but it eliminates paper being permanently trapped in those areas that are hard to get to when it is time to pull off all the paper. Next, I put together section AB + C according to Janeen and use the same technique. I just repeat the same process of pinning the corner, making sure the pins always pierces the corner on top and on the underside in the exact needed placement. At the opposite end, I will do the exact thing again. It may not always look exactly right, but when I fold it down after sewing it together, it is right where it needs to be. The key is putting a pin in the corners and pinning the section together in between those perfect aligned corners. Again, I will take out the basting along the sewn line and take off the paper where I will flip it over. I don't want to take off too much of the paper as I complete each section being sewn together because I want the fabric to remain stable and I still need all those other corners for when I sew sections to them as this all comes together. Here I've put the sections together per the instructions given. Good progress being made and you just keep applying the same technique over and over. When I add the PQ section to MNOKL section and pull the paper off and go to press it, it becomes apparent the there is a lot of fabric in all those intersecting seams and it doesn't want to iron out so well. When that happens I find it best to open up the seams and press them open like so. On a long diagonal I do find that the fabric sometimes will stretch. Especially if you remove to much paper from those seams. I like to baste these together and then open it up. If the sections are properly aligned then I will take it back to the machine and sew it a scant amount to the inside of the baste so that the baste stitches will not be seen when it is ironed in place. When I open it up it looks great so back to the sewing machine I go to finish this beauty. You can see I have the basting still around the outside edge. I take that out and then it is pretty easy to pick most of the paper off the back. The remaining basting stitches are holding this paper on. Eventually I will take those stitches out and pull off the remaining paper. For now, I am ready to give it a light starch spray and call it done!!! I love the end result!!! Can you see the little fussy piece I gave her for a tongue? Love it!!! Another great block for the garden. You can get the pattern free this month from Janeen's website Quilt Art Design and check out all her other fantastic paper piece patterns. Oh wow, you're fabric choices are great! 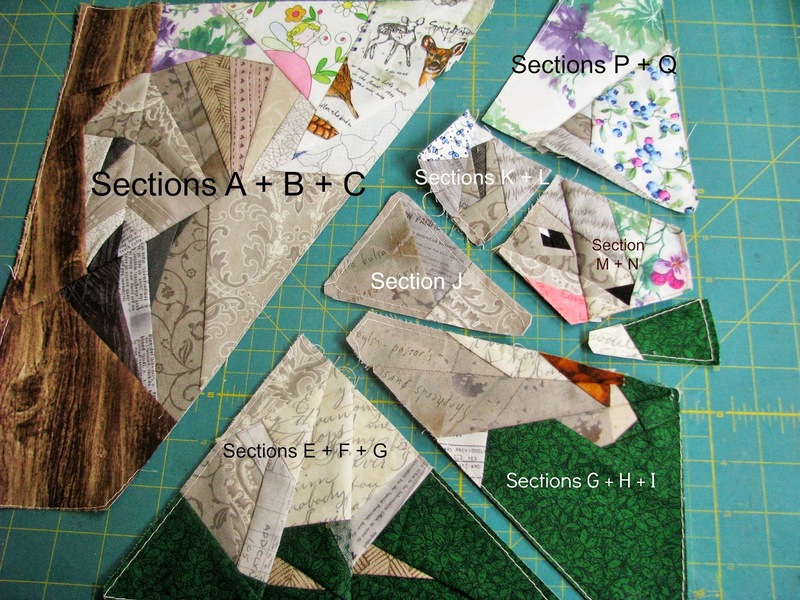 I love paper piecing, but my seam ripper usually gets used quite a bit. Thanks for the tips! Oh wow! You work fast. I'm only on the birdhouse! Great tip with the pins. I do that too. But when I get frustrated with not being able to line them up after a few stabs, I use Clover clips and make sure the corner of the clip lines up to the corner of the pattern section on each side. Also, I press all my seams open. Am I wrong to do that? That is intense and wonderful. Yeah for you. I don't know if I'll ever do pp that small but I like to see what others create. you are a master paper piecer and i spy some blueberries in the block....we love blueberries here in manie...it is our state fruit and a Huge business "down east" meaning as far north on the coast that you can go. that is where eastport is and that is where america first sees the sun....eastport maine, where america greets the day! What a great block. I really like your low volume background, and I've picked up some tips too. I've just finished the June block, reading in the garden. I've had some trouble keeping track of where the fabrics go, so I will try your method on the tulips. I'm finally ready to put the squirrel block together, so I came back here to refresh myself on your tips. I had to redo a couple of pieces on the bee eater blocks because of incorrect fabric placement. I'm definitely going to use a fabric key for the squirrel. This time for sure!